Summer in the blazing hot desert. Do I even have to elucidate anymore? Its been 110F+ for the past 10 days. We are now like vampires; the curtains are always shut to block day light and we go out only after the sun goes down. Yesterday, I didn’t even want to set foot in the kitchen. So, with ingredients on hand, I tossed a salad that was quick, easy, and refreshing. 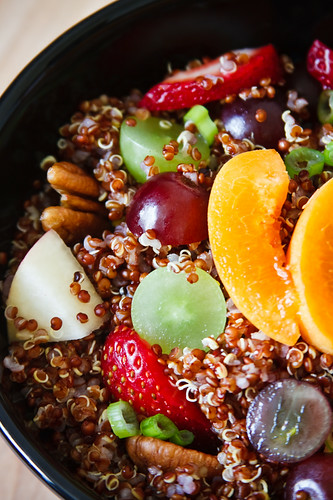 Succulent seasonal fruits, nutty quinoa and a light-sweet dressing – a perfect summer salad. Just the thing I needed. As if agreeing with me, the rain gods showed mercy upon us last night. Today was a cool 106F. I will take anything below 110. Whisk everything together until blended completely. Cook quinoa as you normally would. I usually pressure cook 1 cup of quinoa with 1¼ of water for 2 whistles. Fluff and cool completely. 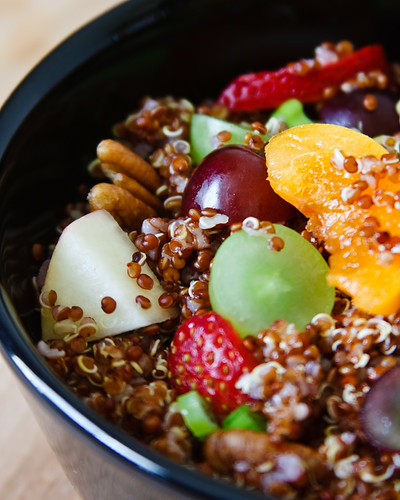 Toss quinoa with the dressing, nuts, fruits and scallions. Enjoy cold or at room temperature! Use other grains in place of quinoa. I have made a similar salad with wild rice mix. Instead of mixed fruits, use cantaloupe, green grapes and fresh mint. Try orange juice and zest instead of lemon. Loose the dressing, and enjoy with low fat yogurt for a satisfying breakfast. There are few standard bittergourd recipes that we enjoy year round. Pitlai is a family favourite, followed by oven baked chips. This time G asked for something different. ‘Why don’t you just do a sauté or a simple curry?’, he asked. Very well. The recipe he was mentioning was an old one that my mom makes often. The gourd is cooked and lightly seasoned with mustard seeds, urad dal and chana dal. When I set to prepare the curry, I thought why not make this into a mixed rice. I haven’t seen bittergourd rice around, so why not extend this curry idea into rice? So I concocted a little spice mixture and prepared this curry. We Loved it (yes, with a capital L). This is definitely a keeper. One technique that I adopted from the curry is to cook the bittergourd in tamarind water to tame its bitterness. Also, 6 red chillies may sound hot, but it is needed to compensate for the bitterness, along with tamarind and jaggery. 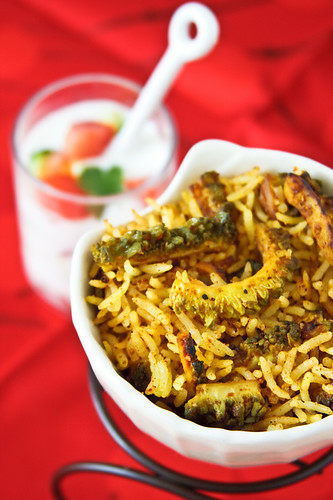 Enjoy this slightly bitter and lightly spiced rice with cool raita. Cook rice with 3 cups of water and ¼ tsp of turmeric powder. Adding turmeric powder gives a golden hue to the finished recipe, which may otherwise be a dull brown. The rice grains should be separate after cooking. Fluff and cool. Cut the bittergourd into half moon rings. 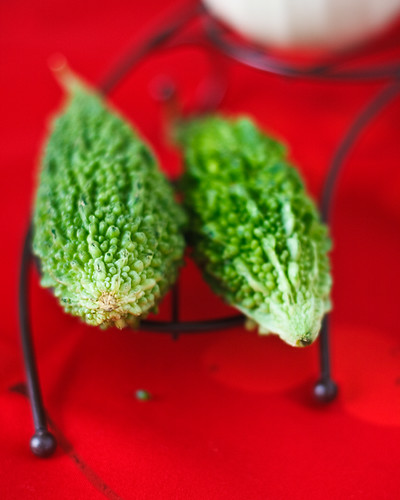 If the seeds are very tough and mature, scrape and discard. Otherwise retain the seeds; they add a mild crunch to the rice. In a wide, deep skillet, roast the ingredients for the spice mixture in a tsp of oil. Cool and grind to a fine powder. In the same skillet, boil bittergourd in 2 cups of water along with salt, turmeric powder and ½ tbsp of tamarind paste. When the gourd has turned soft (but not mushy), drain and discard the liquid. Return the skillet back to heat. In a tbsp of oil, splutter mustard seeds and roast curry leaves. Add the cooked bittergourd, along with ½ tsp of turmeric powder, jaggery and rest of the tamarind paste. On a medium fire, gently roast the gourd. When they start to caramelize, add the spice powder, rice and salt. Mix thoroughly and heat through. If the rice seem very dry, drizzle a tsp of oil. Check for seasoning and serve hot with raita and chips. ...waiting to be devoured. A weekend well spent. 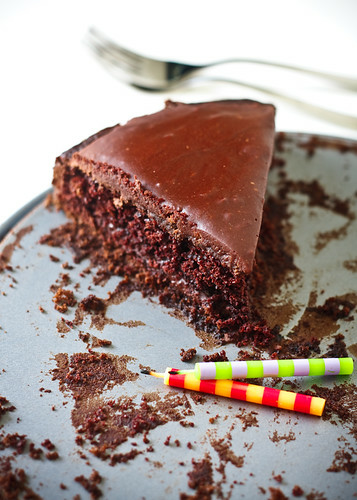 Recipe - Hershey's 'perfectly chocolate' chocolate cake. A cook can never have too many cookbooks. My bookcase somehow seem to grow and have room for good cookbooks. Vegetarian Meals Good Housekeeping Favorite Recipes is one such cookbook. 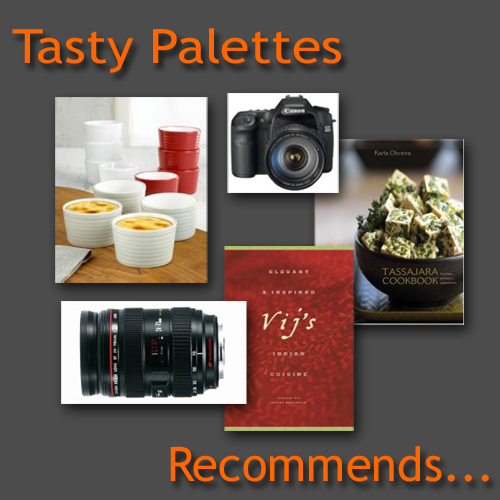 It is filled with recipes that are quick, easy and fun. A good find, considering that I picked this book in a rush without flipping even a single page, from my local library. 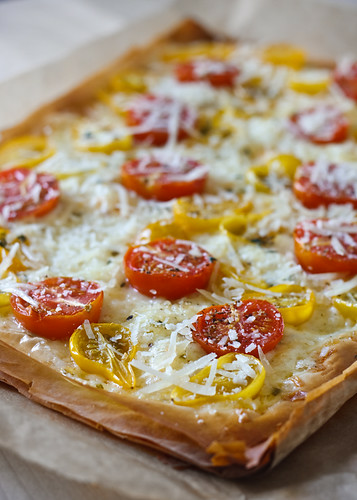 Back at home, when I had the time to patiently flip the pages, vegetarian phyllo pizza caught my attention. A pizza in 20 minutes? Sounds easy. I had to give it a try. And try I did with great results. We were treated with a light and flaky pizza, that we totally loved. Will it replace a traditional pizza in my kitchen? Definitely not. Its not like your usual pizza with chewy crust. But this is definitely a fun idea that’s worth a try. I will definitely make this often for a quick snack or a tasty side. I have tweaked the original recipe by replacing butter with garlic flavoured olive oil. After being smitten with pepper jack cheese on a pizza, I seldom make pizzas any other way. Sorry mozzarella, you have to take a back seat. 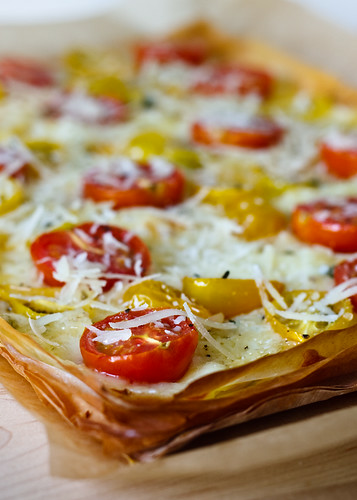 You can also add a variety of toppings, provided they don’t mush the phyllo crust. Preheat the oven to 450F. In a small bowl, combine olive oil and garlic. Mix well and set aside. Line a baking pan with parchment paper (I used a 9x12 pan). Lay 2 phyllo sheets on the parchment paper. Brush with olive oil + garlic mixture. Repeat twice to finish layering all 6 sheets. Brush the top with remaining oil mixture. Evenly spread pepper jack cheese and tomatoes. Sprinkle with oregano, salt and pepper. Bake for 12 to 15 minutes. Remove from the oven, sprinkle with parmesan cheese. Serve warm. I served mine with orzo salad loaded with tomatoes, olives and tons of fresh herbs. A delicious lunch that we enjoyed very much.